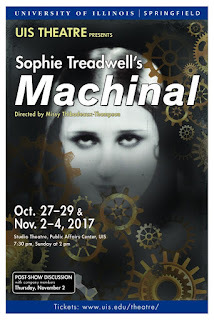 The Theatre Program at the University of Illinois Springfield presents “Machinal” by Sophie Treadwell opening Friday, October 27. Six performances will be presented in the Studio Theatre, on the lower level of the Public Affairs Center at UIS, on Friday, Saturday, Sunday, October 27, 28, 29 and Thursday, Friday, Saturday, November 2, 3, 4. All shows will begin at 7:30 p.m., except the Sunday performance (April 9), which will begin at 2 p.m.
Missy Thibodeaux-Thompson, UIS associate professor of Theatre, will direct the production. Dathan Powell, UIS assistant professor of Theatre, will be the scenic designer and technical director. “Machinal” is an expressionist play inspired by the sensational 1927 New York murder trial of Ruth Snyder. “Machinal,” told in nine episodes, focuses on a young woman, as she navigates the oppressive, mechanized, hard society and the cultural expectations placed on her – and all women at the time. Treadwell takes the young woman through the stages of a kind of modern everywoman: work in a boring office, marriage to a boss who offers financial security, a motherhood that oppresses her, and a lover who abandons her. The cast includes UIS students Beatrice Bonner, Shanda Courtaway, Dawson Daffron, Diamond Dixon, Chris Vemagiri Marbaniang, Krista Massat, Sherri Mitchell, Grant Naughton and Katie Simpson, along with UIS alumni Blake Detherage, Tom Hutchison and Ellyn Thorson and community members Sean McCord, Nic Mulcahy, Kenny Naughton and Judy Nichols. Ticket prices are $14 for adults; $12 for senior citizens (65 or older with a picture I.D. ); $10 for UIS Faculty/Staff; $8 for UIS students (and all other college-level students) with a valid, current i-card or college I.D. card; and $6 for 17 and under. Please note that a service charge from Sangamon Auditorium, not included in the prices above, will be added to each ticket price, at the time of purchase. To avoid a higher service charge, buying tickets in person at the Sangamon Auditorium ticket office is highly recommended. You may also purchase tickets over the phone by calling 217/206-6160. For more information on the production, please visit the UIS Theatre website at www.uis.edu/theatre.